Turn off the main switch on your consumer unit (fuse box). Remove the appropriate circuit breaker/fuse for the lighting circuit (put this in your pocket so there is no way ‘others’ can make the circuit live whilst you are working). You should now be safe to work on your lighting circuit now. BUT HOLD YOUR HORSES – I strongly recommend you don’t take this for granted and phisically test to ensure there is no power at one of the the ceiling roses!! 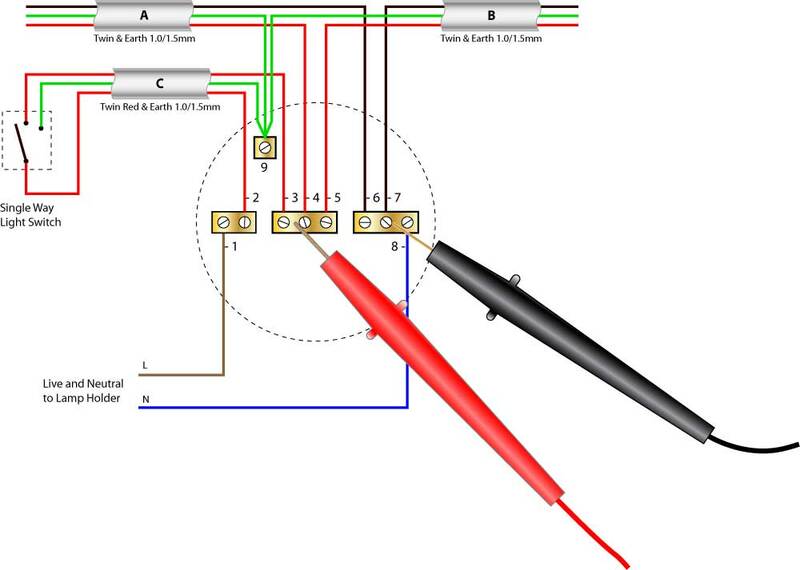 Using your voltage tester or multi-meter (set to AC volts) test for a voltage accross the live and neautral terminals of the ceiling rose as shown below (please note that in more recent installations the cable colours will be Brown and Blue). Finally, switch on all the remaining lights that you will be working on (just in case they are fead from a different circuit than the one you isolated.